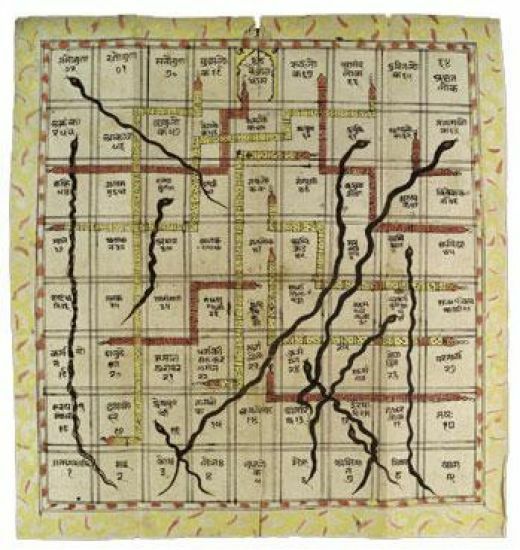 Games like, Chess, Snakes and Ladders, Playing Cards, Polo, the martial arts of Judo and Karate had originated in India and it was from here that these games were transmitted to foreign countries, where they were further developed. Several games now familiar across the world owe their origins in India, particularly, the games of chess, ludo (including ladders and snake), and playing cards. The famous epic Mahabharata narrates an incidence where a game called Chaturang was played between two groups of warring cousins. Thus this game was known in India nearly 4000-5000 years ago. "Ashtapada" Sanskrit for spider -"a legendary being with eight legs" was played with dice on an 8x8 checkered board. There were no light and dark squares like we see in today's chess board for 1,000 years. Other Indian boards included the 10×10 Dasapada and the 9×9 Saturankam. Krishna and Radha playing chaturanga on an 8x8 Ashtāpada. Later this game came to be known as chaturanga. The Sanskrit name Chaturanga means 'quadripartite' — the four angas (divided into four parts). The earliest known form of chess is two-handed chaturanga, Sanskrit for "the 4 branches of the army." Like real Indian armies at that time, the pieces were called elephants, chariots, horses and foot soldiers. Unlike modern chess, chaturanga was mainly a game of chance; results depended on how well you rolled the dice. 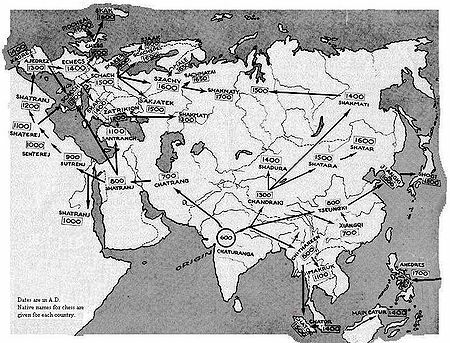 Map showing origin and diffusion of chess from India to Asia, Africa, and Europe, and the changes in the native names of the game in corresponding places and time. 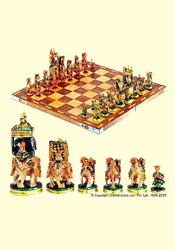 Chaturanga is well recognized as the earliest form of chess. Played on an authentic cloth game surface by 2, 3 or 4 players, Chaturanga combines the basic strategy of chess with the dynamic challenge of chance as each move is determined by the random roll of wooden dice. There is evidence of ‘chaturanga’ having been played with dice, which is still not uncommon, although it involved more skill than chance in this version. In fact, Yudhishthira and Duryodhana, in the Mahabharata, played a version of chaturanga using a dice. The game Chaturanga was a battle simulation game which rendered Indian military strategy of the time. In 600 AD this game was learned by Persians who named it Shatranj. Shatranj is a foreign word among the Persians and the Arabians, whereas its natural derivation from the term Chaturanga is obvious. Again affix the Arabic name for the bishop, means the elephant, derived from alephhind, the Indian elephant. Even the word 'checkmate' is derived from the Persian term Shah Mat which means 'the king is dead!'. The Sanskrit translation of this term would be Kshatra Mruta. Another term viz. 'the rooks' which is the name for one set of the counters used in chess, originated from the Persian term Roth which means a soldier. The Persian term is derived from the Indian term Rukh, which obviously seems to have originated in the Sanskrit word Rakshak which means a soldier from Raksha which means 'to protect'. About the introduction of this game into Persia, the Encylopedia Britannica says that the Persian poet Firdousi, in his historical poem, the Shahnama, gives an account of the introduction of Shatranj into Persia in the reign of Chosroes I Anushirwan, to whom came ambassadors from the sovereign of Hind (India), with a chess-board and men asking him to solve the secrets of the game, if he could or pay tribute. The king asked for seven days grace, during which time the wise men vainly tried to discover the secret. Finally, the king's minister took the pieces home and discovered the secret in a day and a night. The Encyclopedia Britannica concludes that "Other Persian and Arabian writers state that Shatranj came into Persia from India and there appears to be a consensus of opinion that may be considered to settle the question. Thus we have the game passing from the Hindus to the Persians and then to the Arabians, after the capture V of Persia by the Caliphs in the 7th century, and from them, directly or indirectly, to various parts of Europe, at a time which cannot be definitely fixed, but either in or before the 10th century. That the source of the European game is Arabic is clear enough, nor merely from the words "check" and "mate", which are evidently from Shah mat ("the king is dead"), but also from the names of some of the pieces. Tamil variations of chaturanga are ‘puliattam’ (goat and tiger game), where careful moves on a triangle decide whether the tiger captures the goats or the goats escape; the ‘nakshatraattam’ or star game where each player cuts out the other; and ‘dayakattam’ with four, eight or ten squares, a kind of ludo. Variations of the ‘dayakattam’ include ‘dayakaram’, the North Indian ‘pachisi’ and ‘champar’. There are many more local variations. According to Abul Fazal's (author of the Ain-e-Akbari) description of the game, the following cards were used. The first was Ashvapati which means 'lord of horses'. The Ashvapati which was the highest card in, the pack represented the picture of the king on horseback. The second highest card represented a General (Senapati) on horseback. After this card come ten other with pictures of horses from one to ten. Another set of cards had the Gajapati (lord of elephants) which represented the king whose power lay in the number of elephants. The other eleven cards in this pack represented the Senapati and ten others with a soldier astride an elephant. Another pack has the Narpati, a king whose power lies in his infantry. We also had other cards known as the Dhanpati, the lord of treasures, Dalpati the lord of the squadron, Navapati, the lord of the navy, Surapati, the lord of divinities, Asrapati, lord of genii, Vanapati, the king of the forest and Ahipati, lord of snakes, etc. On the authority of Abul Fazal we can say that the game of playing cards had been invented by sages in ancient times who took the number 12 as the basis and made a set of 12 cards. Every king had 11 followers, thus a pack had 144 cards. The Mughals retained 12 sets having 96 cards. These Mughal Ganjifa sets have representations of diverse trades like Nakkash painter, Mujallid book binder, Rangrez, dyer, etc., In addition there were also the Padishah-i-Qimash, king of the manufacturers and Padishah-izar-i-Safid, king of silver, etc. Cards were known as Krida-patram in ancient India. These cards were made of cloth and depicted motifs from the Ramayana, Mahabharata, etc. A tradition carried on today with floral motifs and natural scenery. The pre-Mughal origin of the game of cards is evident if we examine the pattern of painting the cards. We also find that despite the observation of Abul Fazal that Akbar introduced the pack with 8 sets, we find that even earlier, in Indian (Hindu) courts we have packs with 8, 9 and 10 sets apart from the usual 12. The numbers were derived from the eight cardinal directions Ashtadikpala, for the pack with 8 set, from the nine planets Navagraha for the one with 9 sets and from ten incarnations Dashavatara of Vishnu for the pack with 10 sets. Themes from the Ramayana and Mahabharata are painted on these cards. The largest number of such cards are to be found in Orrisa. The largest number of such cards are to be found in Orissa. The painters from Orissa have represented various illustrations like the Navagunjara, a mythical birdhuman animal which was the form assumed by Sri Krishna to test Arjuna's fidelity, illustrations from the Dashavatata of Vishnu are also portrayed. All these cards were hand-made and were painted in the traditional style. This required considerable patience and hard meticulous work. The kings usually commissioned painters to make cards as per their preference. The commoners got their cards made by local artists who were to be ; found in urban and rural areas. In order to -obtain the required thickness a number of sheets of pieces of cloth were glued together. The outlines of the rim were painted in black and then the figures were filled with colors. As cards were played by members all strata of society we find different types of cards. Some cards were also made of ivory, tortoise shell, mother of pearl, inlaid or enameled with precious metals. The cards were of different shapes; they were circular, oval rectangular, but the circular cards were more common. The cards were usually kept in a wooden box with a lid painted with mythological figures. This art of handmade, hand painted cards which had survived for hundreds of years. gradually feel into decay and became extinct with the introduction of printed paper cards by the Europeans in the 17-18th centuries. With the extinction of the art of making and painting cards also was erased the memory that Indians ever had played the game of cards with their own specific representations of the Narapati, Gajapati and Ashvapati. The game had its origin in India and was called Moksha Patam or Parama Padam or Mokshapat. It was used to teach Hindu Dharma and Hindu values to children. The British renamed it as Snakes and Ladders. The game was created by the 13th century poet saint Gyandev. The ladders in the game represented virtues and the snakes indicated vices. The game was played with cowrie shells and dices. Later through time, the game underwent several modifications but the meaning is the same i.e good deeds take us to heaven and evil to a cycle of re-births. There are certain references which take the game back to 2nd century BC. In the original game square 12 was faith, 51 was Reliability, 57 was Generosity, 76 was Knowledge, and 78 was Asceticism. These were the squares were the ladder was found. Square 41 was for Disobedience, 44 for Arrogance, 49 for Vulgarity, 52 for Theft, 58 for Lying, 62 for Drunkenness, 69 for Debt, 84 for Anger, 92 for Greed, 95 for Pride, 73 for Murder and 99 for Lust. These were the squares were the snake was found. The Square 100 represented Nirvana or Moksha. The British took the game to England in 1892 and named it Snakes and Ladders and changed it according to Victorian values. The dice is attributed to India by some accounts. 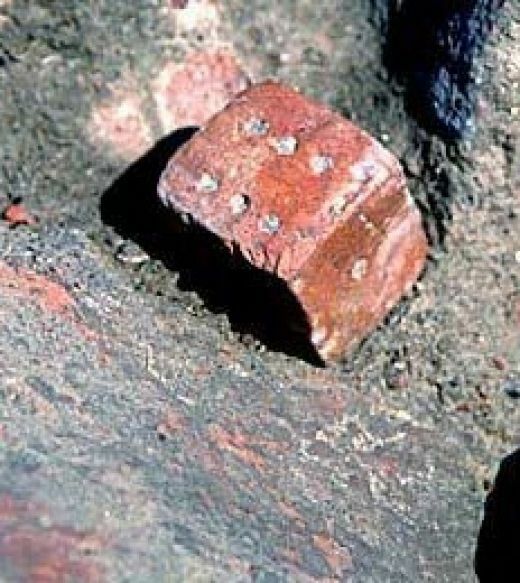 Some of the earliest archaeological evidence of oblong dice have been found in Harrapan sites such as Kalibangan, Lothal, Ropar, Alamgirpur, Desalpur and surrounding territories, some dating back to the third millennium BCE, which were used for gambling. The oblong or cubical dice (akṣa) is the precursor of the more primitive vibhīṣaka—small, hard nuts drawn randomly to obtain factors of a certain integer. Dicing is believed to have later spread westwards to Persia, influencing Persian board games. Early references to dicing can be found in the Ṛig Veda as well as the newer atharvaveda. A die found in excavations at a Harappan period site. Note that the six is not opposite the one.